Dr. Brian S. Orcutt at Orcutt Family Dentistry creates beautiful smiles without the pain and anxiety you fear from dental offices. Dr. Orcutt’s first priority is to deliver high-quality dental care in a stress-free, comfortable environment. At Orcutt Family Dentistry, we employ state-of-the-art technology for all your dental needs. Our range of services includes nearly painless laser treatment for gum disease and cavities, sedation dentistry (also known as oral conscious sedation or sleep dentistry), Invisalign clear braces, dental implants and CEREC same-day crowns as well as full family dental care and more. We serve dental needs for Fair Oaks and the surrounding areas of Citrus Heights, Orangevale, Carmichael, Roseville, Folsom, and Sacramento. Orcutt Family Dentistry will give you the expert care you deserve. Please browse this website for more information about Dr. Orcutt, our dedicated team, our array of services, general information on oral health and some patient reviews. If you have questions on dental health, please feel free to contact us. To make an appointment, please call our office at 916-961-8454 or use our convenient online contact form. 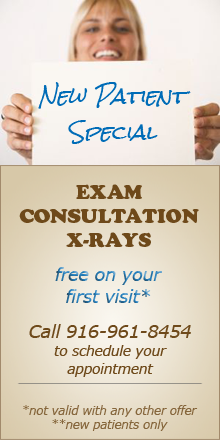 If you’re a new patient, see our special offer below. Fair Oaks Dentist, Dr. Brian Orcutt is a professional dedicated to Excellence in General, Family, & Cosmetic Dentistry such as Dental Makeovers, Porcelain Veneers, Teeth Whitening, Crowns/Caps & many other dental procedures. Please come and visit Carmichael Dentist, Dr. Brian Orcutt.